The Chemistry of the Superheavy Elements and Relativistic Effects(V.Pershina). Accurate Relativistic Fock-Space Calculations for Many-Electron Atoms (U. Kaldor et al). Accurate Relativistic Calculations Including QED Contributions for Few-Electron Systems (W.R. Johnson et al). Parity-Violation Effects in Molecules (R. Berger). Accurate Determination of Electric Field Gradients for Heavy Atoms and Molecules (M. Pernpointner). Two-Component Relativistic Effective Core Potential Calculations for Molecules (Yoon Sup Lee). Relativistic Ab-Initio Model Potential Calculations for Molecules and Embedded Clusters (L. Seijo, Zoila Barandiaràn). Relativistic Pseudopotential Calculations for Electronic Excited States (C. Teichteil et al). Relativistic Effects on NMR Chemical Shifts (M. Kaupp). Relativistic Density Functional Calculations on Small Molecules (C. van Wüllen). Quantum Chemistry with the Douglas-Kroll-Hess Approach to Relativistic Density Functional Theory: Efficient Methods for Molecules and Materials. (N. R&öunk;sch et al). Relativistic Solid State Calculations (H. Eschrig et al). The field of relativistic electronic structure theory is generally not part of theoretical chemistry education, and is therefore not covered in most quantum chemistry textbooks. This is due to the fact that only in the last two decades have we learned about the importance of relativistic effects in the chemistry of heavy and superheavy elements. Developments in computer hardware together with sophisticated computer algorithms make it now possible to perform four-component relativistic calculations for larger molecules. Two-component and scalar all-electron relativistic schemes are also becoming part of standard ab-initio and density functional program packages for molecules and the solid state. The second volume of this two-part book series is therefore devoted to applications in this area of quantum chemistry and physics of atoms, molecules and the solid state. Part 1 was devoted to fundamental aspects of relativistic electronic structure theory whereas Part 2 covers more of the applications side. 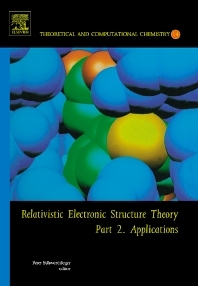 This volume opens with a section on the Chemistry of the Superheavy Elements and contains chapters dealing with Accurate Relativistic Fock-Space Calculations for Many-Electron Atoms, Accurate Relativistic Calculations Including QED, Parity-Violation Effects in Molecules, Accurate Determination of Electric Field Gradients for Heavy Atoms and Molecules, Two-Component Relativistic Effective Core Potential Calculations for Molecules, Relativistic Ab-Initio Model Potential Calculations for Molecules and Embedded Clusters, Relativistic Pseudopotential Calculations for Electronic Excited States, Relativistic Effects on NMR Chemical Shifts, Relativistic Density Functional Calculations on Small Molecules, Quantum Chemistry with the Douglas-Kroll-Hess Approach to Relativistic Density Functional Theory, and Relativistic Solid State Calculations. Will no doubt become a standard text for scientists in this field. All chemistry and physics departments and libraries worldwide. Also all chemical companies, especially those involved in heavy element research.